There's been a ton of debate in the last few years about the future of publishing. Are e-readers going to replace paper books? Are bookstores doomed? Is publishing doomed now that self-publishing is so easy? I will say no to all of that, at least for the foreseeable future. I read A LOT. Paper books, e-books, unpublished manuscripts - as well as heaps and piles of book and publishing related blogs and articles. I want this to be my career, so of course I want to take the most positive outlook on the future of publishing in general. But I've noticed something when I read, whether it is the latest hardcover release from a favorite author, a worn-out old paperback that I got third or fourth hand from a friend, an e-book on my kindle, or a manuscript I'm reading for a CP on my laptop. I ENJOY ALL OF IT. I don't think I completely prefer one method of getting the words from the author and into my brain over another. For most people, the choice is between physical paper books and e-readers (or another electronic device with e-reader software installed), so I thought about the pros and cons of each method, and came to the conclusion that I like both equally, but for different reasons. Let's begin with good old-fashioned paper books. The wonderful tactile and sensory experience of books. I love the way new books smell. I love the feel of the paper, the repetitive act of turning pages, the gorgeous covers, and in hardcover books, the secrets that lurk beneath the book jacket. Often you remove that beautifully printed outer cover to discover something equally lovely underneath, a secret clue to the heart of the story contained within. I love being able to see all my books stacked around me, on the bookshelves decorating my home, and randomly piled up waiting to be read and loved. I can easily loan a favorite book to a friend. A friend can easily loan their favorite book to me! While reading, I can easily skip around, page back to find a passage that only shows it's true meaning several chapters later when a larger secret is revealed, or even page ahead a few chapters because I'm terrified something scary is coming up for one of the characters and I need reassurances that everything will be okay. Yes, I cheat sometimes. Sue me. Paper books are often heavy and bulky. They're hard to carry around. When I go on a trip, I like to take more than one book with me. I'd hate to run out of reading material, but lugging several books in a small suitcase is impractical. If I spill coffee on my favorite book, I'd have to go buy a new copy. Paper and liquids are not friends. Books are fragile. They wear out after a while, even when well taken care of, especially if Helper Monkey or Lulu hauls them around for a few weeks. Nice books plus middle-schooler's backpack equals battered books. It's easy to carry around HUNDREDS of books at any given time, in a package smaller and lighter than a single paperback. I'll never run out of things to read! An e-reader is relatively inexpensive, and the prices keep coming down. 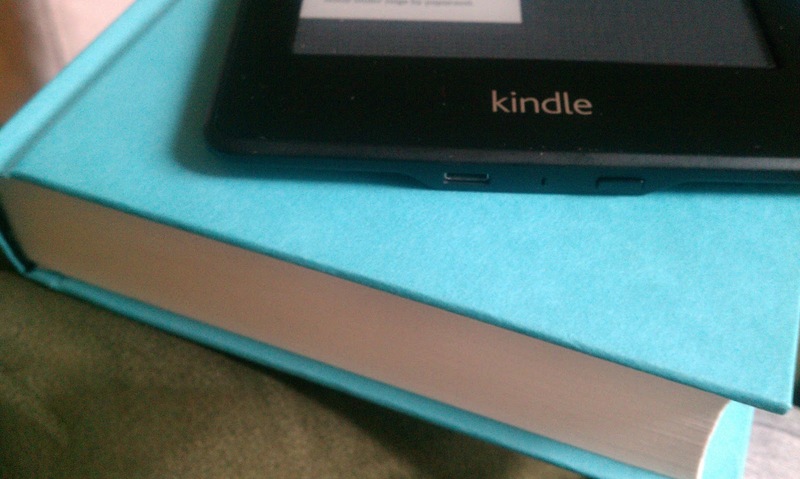 Even if I spill coffee on it (or squish it, like I did to my original kindle), all my books aren't lost forever. I can still access them through my laptop, or even my cell phone, in theory. Replacing it would only cost about the same as buying four or five new release hardcovers. An e-reader is lightweight. It's SO much easier to read in bed. My wrists have thanked me. Not to mention, I don't have to worry about dog-eared pages or torn covers from carrying an e-reader around in my purse or pocket. I have a kindle paperwhite, which I love. I don't need a book light to read in the dark anymore, and the battery lasts quite a good long while. Like for the duration of four or five books worth of reading. I haven't tested how long it will last, but it's long enough that I haven't been worried I'll lose power in the middle of something. I can buy a book and be reading it within seconds. No waiting for shipping, and no drive to the mall to pick up a book on a whim. There's not a lot of romance in the plastic of an e-reader. No literal page turning, no smell of new book, no gorgeous cover artwork. It's nearly impossible to page back and find something that's referred to later in the book. It's highly irritating sometimes when you really want to find that one little passage that gives a richer experience of later revelations in a story. I'm sure I've left out a ton of reasons why either format is great or lacking. If you've got a definite preference, please let me know your thoughts and reasons. I'm just glad I live in an era where everyone has easy access to any book they might want to read. We can walk into a library, a bookstore, or surf the internet to find WONDERFUL stories to cram into our brains in whatever way is easiest or most enjoyable for us. Isn't is FANTASTIC and MIRACULOUS?! I mean, five hundred years ago, books were only for the very wealthiest people. Now they are for EVERYONE! HOORAY! I like book books. I've never had an ereader. I am a librarian, and we even have eresources now. I like that there are more choices for the reader to glut on all the books! Like you, I love both. I ADORE my iPhone and have been able to download tons of stuff for free or for really cheap--you just have to pay attention to author promotions, which I do anyway through my blog. And, like you said, I love having a ton of books to choose from wherever I go. I own more books on my iphone than I could ever afford before.